Lumbini, located in the Rupandehi district of Southern Nepal, is the historic birthplace of Lord Gautam Buddha. He was born as an heir to the throne to King Sudhodhana and Queen Maya Devi during the fifth century. Today, the main site is known as Lumbini Development Zone and is sealed in by a perimeter fence. It is the most important, religious, and significant site to more than 500 Buddhist people all over the world. And rightfully, this place won’t disappoint you. From exploring the myriad of international monuments to exploring the relics of a fallen kingdom to joining a mediation class, you can do and see everything you’re hoping for. Here is our list of top five things to do in Lumbini. As a homage to Buddha’s birthplace, more than 25 countries have constructed a monastery distinct to their own architectural style, beliefs, and history. Each monastery is very unique from the other, but all of them blend architectural magnificence with spiritual elements. For instance, Thailand’s Royal Thai Buddhist Monastery is a superlative war-style monastery made with gleaming white marbles. Similarly, the Myanmar Golden Temple is a stunning, golden comcob-shaped Shikhara that is inspired by the temples of Bagan. Even a day might be enough to behold and appreciate the beauty and splendor of all 25 monasteries. Just 29 kilometers west of Lumbini, Tilaurakot is the “identified” historical site of Kapilvastu, where Buddha spent first 20 years of his life. The holy site is located in a peaceful and quiet meadow on the banks of Banganga River. 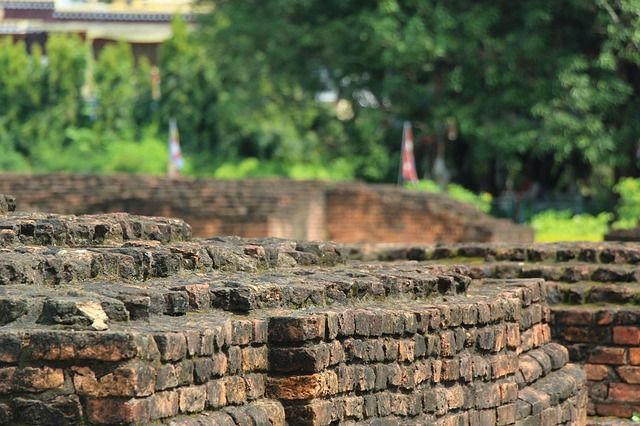 You can explore the foundations of the historic and large residential compound from Buddha’s time. There is also a beautiful shrine nearby with numerous carved pachyderms, dedicated to Buddha’s mother Maya Devi. There is also a museum at the last turn-off to Tilaurakot which showcases some of the ancient artefacts and articles found at the site. There is also a new and bigger museum building that is very close to completion. If you want to get under the skin of any place, visit its villages, not towns. Same is the case for Lumbini. Rental two-wheeler is the best way for sightseeing the entire area in short time. Rickshaws, bicycles, and motorcycles are readily available near the main Lumbini site. The roads are generously wide and flat, the weather is sunny and bright, and the traffic is minimal. You will get to see ancient agriculture methods in practice, interact with the locals, and traverse through mustard and rice farms. You can rent the vehicles in an hourly or a daily basis for very less price. Thus, it is cheap, fun, and safe. It is the 21st century and everyone is living in the fast lane. It is very rare for any destination to provide the escape but also a spiritual revelation at the same time. Most of us have tried and discontinued meditation at some point, but when you’re at the very birthplace of Buddha himself, the vicinity itself will motivate you to try medidation once again. There are several meditation centers run by Buddhist monks like the Panditarama Vipassana Center. You can sign up for any one of the flexible packages and meditate under the guidance of these seasoned teachers. You will even learn several techniques and teachings to take back home with you. Exploring the Maya Devi temple is definitely the most enriching of all the things to experience in Lumbini. The plain and white exterior is nothing too impressive, but on the inside, it houses the centuries-old mark stone of Buddha’s birthplace. Moreover, the building is housed within the remains of Buddha’s exact birthplace. There are ruins ranging from 2nd to 7th century, and there is a pond nearby where Buddha’s mom took a bath after giving birth. There are also seven engrained steps which are believed to be Buddha’s as he walked right after being born. There is an eternal flame, a historic pillar by emperor Ashoka, a Bodhi tree laden in prayer flags, and so much more!